Also starring: Some of the random geek boys, and the geek stalker. Summary: William stops by to shop for a friend. Leslie the alpha geek gets a date with Kory. Evening in the Lair, on a Thursday is usually busy. All the good shows are still on winter hiatus, and geeks don't necessarily care so much about sports. So the geeks are huddled together, playing. Tito's at the register. Chewbacca's staying under the table, begging scraps or cadging them as they fall from the gamers' table. William makes his way in the door, hands down in the pockets of his coat. He's dressed casually, with jeans, tennis shoes, and a plain green t-shirt under that coat. Tito gets a friendly smile as he pauses to look around. Tito grins at William. "Hey, you. Long time no see. Happy new year, and like that." Will's a regular, so he doesn't make the usual inquisitive spiel. At the back of the room, one of the geeks looks up expectantly — the alpha geek, the one whose name changes every week. He sees it's William, and with a careful exhalation of breath, goes back to ducking behind his GM screen. "You waiting for somebody tonight, Byron?" asks one of the geeks, shaking his dice and letting them roll. Ouch. Critical failure. "It's not Byron, and yes," the GM answers. William looks over to the alpha geek and just shakes his head. He doesn't need to challenge him. Instead he'll head over to Tito at the counter. "Happy New Year to you, too. I've been busy, but good busy." He pauses for a moment before he asks. "Do have any Superman t-shirts? Or maybe a cape?" Tito raises a brow. "Kid size or adult size?" he asks, otherwise straight faced. The question must not be an odd one for the small staff of the Lair. The alpha geek blinks over at William and gives him a sheepish smile. "Sorry. Was just hoping it was somebody else is all," he says, a little nervously, gleefully returning to the consequences of his tablemate's critical botch roll. William nods over to the alpha geek. "Not a problem." He's hardly going to let that kid ruffle his feathers. Instead he looks over to Tito. "Adult. One of my friends is turning 30 soon. He's still with the SEALs, so it seemed a good joke." Tito laughs. "Yeah. We've got the shirt and the cape," he says, shaking his head at the idea of pranking a Navy SEAL with a Superman costume. "I gotta go get the cape out of the back, but the shirts are over there." He gestures to the other side of the 9th Wonders and Comics-By-Powers display. "If we're out of the plain old Big Blue style, I can probably have something ordered in for you in a day or two." The 'plain old Big Blue style' is one of several varieties of Superman shirt on the rack, including "On fire", "dripping with blood", "metallic", and "sparkly pink" — hence the mention of distinct style. The young man — who's 27 but only looks perpetually fifteen — looks up again. Now he's smiling, game forgotten, because the person he most obviously was waiting for has arrived. These are the people we haven't even met! William gives Tito a smile. "Perfect. And the best part is, he's in San Diego, so I won't even have to see how close to fighting shape I've stayed in." Will says before he gives Kory a smile. "Evening." He greets the singing one, heading over to look at the t-shirts. The pink one gets a genuine laugh. "Hi, Will!" Kory greets the man, looking chipper as usual. Well, as usual from William's standpoint, perhaps. She's been moping around, mostly, like Miss Judy Out Of Love as portrayed by Rosey the Robot on The Jetsons, but today she looks well rested, and positively bouncy. "Good to see you again." For the minute and a half before his phone rings and he has to leave, speaking in Sanskrit or something. "Kore…?" the alpha geek calls from his spot at the table. William turns to show Kory the pink shirt. "What do you think of this for a tough SEAL?" He asks with an amused smile. For the moment, he's sticking to English. That could change at any second though. You never know. Kory looks up from being about to hug the blushing, beaming alpha geek, and blinks at William. "Do you mean seal as in 'small barking aquatic mammal who can play 'How Dry I Am' on the bulb horns?" she asks, carefully, smiling as though she suspects the answer is different. "You liked them," the alpha geek murmurs, though he stills his obvious delight as she takes care of business. William nods over to Kory. "Yes." He says, seriously for a moment before he shakes his head. "No. I mean Navy SEALs." He says in an 'of course' tone. "You know, a group of buff macho men who can handle any weapon, vehicle, and person alive. One of my friends is turning thirty. I think he needs a cape and S to show his status." "Oh. Well. Um." Kory grins, behind a hand. "I think if you two are close enough that you can give him a Supergirl shirt in sparkly pink without him using one of those 150 ways to kill you with his pinkie — you must be dear friends indeed." William looks over to Kory. "He was my swim buddy." Will says as if that means something. He does put the sparkly pink shirt back in favor of a dark blue classic superman t-shirt. "Besides, I know all 150 ways just as well as he does." Kory can't help but chuckle at that. "That would make an interesting thirtieth birthday party," she tells him. "Explosion at birthday party. Debris covered in pink glitter," she says, hands lifting as if she is envisioning a newspaper headline. William laughs at that statement. "It would make for quite an interesting birthday, though, wouldn't it? Nah, I think I'll stick to the classic. I bet his son will love it at least." Will states, checking for the right size of shirt. Kory beams at William. "Do you want a little one so they can have a father-and-son thing?" Tito emerges with the cape, still wrapped in plastic. Tito facepalms and then goes back for another cape, hearing Kory. "And yes," Kory assures the alpha geek, who's been patiently waiting. "I loved them. That was really sweet of you." The other geeks at the table stare in astonishment; one of theirs is getting attention from a girl! Kory's always nice, but this is different! William gives Kory a smile. "That's a good idea. His boy is three. I bet he'd get a kick out of being Superman, like his dad." Will states, moving over to look for a matching shirt in tiny size. Kory smiles contentedly. She knows her customers, and she knows the trends. "Kid size rack's up at the top, on the endcap. Easy for moms to get to, but not little hands." The alpha geek clears his throat, ostentatiously, and smiles as engagingly as he might when Kory turns around. "So — you gonna let me take you out?" A beat. "Just as friends?" Kory raises a brow. "I suppose that's doable," she allows. "For giving me new mixables, it's the least I can do." William lets Kory set up her own geeky date. He's busy finding that endcap, and a shirt and cape in little tiny. The smile hovering around his lips show that he's happy with this addition to what he'd planned to buy. And extra money for the Lair. "Thanks, Kory. I just wish I could be there to see Jose's face when he sees this." "You probably could," Tito suggests. "Get a little USB minicam, put it in the box with enough batteries so it holds a charge, and have it fire off at random intervals after UPS shows it has reached its destination." "Tito, that's evil," Kory mock-gasps, as her date seems to be fighting not to victory dance in his chair, and goes back to his game cohorts. William laughs. "That is. Though I could also send him a little USB camera to hook to his computer. And tell him he has to have me online before he opens anything else." Will considers that. It's worth looking into the cost of at least. "That presupposes you have to either put OPEN ME FIRST on the camera," Kory points out, "Or send the camera a couple days ahead of the — " she pauses, as the alpha geek has taken her hand. She blushes faintly, and does not ask for it back. " —other gift." William gives a quick smile for the geeky flirting and then nods. "Sending it earlier would work well. And it would be nice in the long run, just as a way to communicate since we live on different sides of the country." "Yeah," Kory agrees. "That's going to be what Anzeti and I do when he finally moves out of New York. So I can give him advice that will be useful to him before he gets himself in trouble." She notices William's smile and shrugs, sheepishly. Tito, on the other hand, looks like someone hit him in the head with a two by four. William nods over to Kory. "Sounds like a good plan." He states, as he makes his way up to pay for the shirts and capes. "Or I could make a deal with him that we'll each get a camera for our computers so we can have video chats. I can guilt him about never getting to see my godson." "Well, do bring a picture for the wall if you decide to do that," Kory suggests. "We always love to see our customers' purchases in their new homes." Tito stops staring at Kory like she's grown a third breast between her shoulderblades, and takes William's purchase to ring up. The alpha geek doesn't even glower at Tito; he's in that euphoric place geeks go when girls they like are giving them a shot. William hands over his debit card, paying for the presents. "Will do." He tells Kory. He's actually already on the way out the door before his phone rings. He answers it, starting to chatter away in fluent Farsi as he leaves with a last wave. Kory and the alpha geek spend a few moments with their heads together, whispering. "…at seven," she tells him. "And nothing fancy. This is a just friends date," she tells him. "Right. Dinner and a movie or something like that," the geekboy assures her of his understanding. "See you Saturday at seven." A Saturday night date, but just as friends? Well, it's a hopeful sign. Kory confirms, "Saturday, at seven," and vanishes into the office to get some work done. A few minutes later, the guy to the alpha geek's left asks, "Leslie — what's your secret? How'd you get Kory to agree to a date with you, anyway?" Leslie, who normally seethes at being addressed as such is so stoked he doesn't even glower. He beams. "Easy. Extensive course of carefully administered drugs disguised as an insomnia cure, plus subliminal messages embedded in the mp3s I sent her…and just being nice to her whenever she's around." The guy to his left rolls his eyes and snorts. "Okay. Fine. Be like that. Gloat that you're gonna get some most likely, and don't share your secret." Leslie rises, calling the game done for the night, and walks out whistling the same tune Kory was singing when she walked in. After Kory's date with Leslie, the following bouquet of flowers arrives at the Secret Lair with a note attached, bearing the following poem. 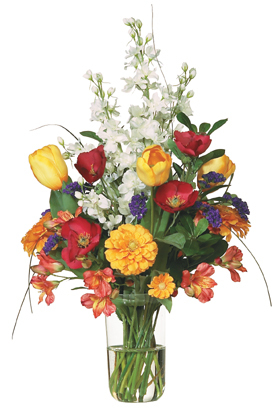 Anyone curious enough to look up the flower bouquet will find it retails for $99 at a go. Wow!